Leaked information from German telecom has revealed yet more juicy details regarding HTC’s in-the-works phablet device. The 5.9 incher code named “T6” is the One Max, and packs a beast-load of features, including a 2.3GHz quad-core Snapdragon 800 processor and 2GB of RAM. Details also indicate that the upcoming tablet will run on the upcoming Android 5.0 Key Lime Pie and is slated for a September 2013 release date. The leaked document from the German counterpart of a London-based telecom detailed its internal road map, including specifications of upcoming devices. This has been corroborated by a reliable internal source confirming the validity of the information on the T6. The insider, according to gadget news site Mobilegeeks.de, also reported that the One Max will be one of two devices scheduled for Q3 2013. 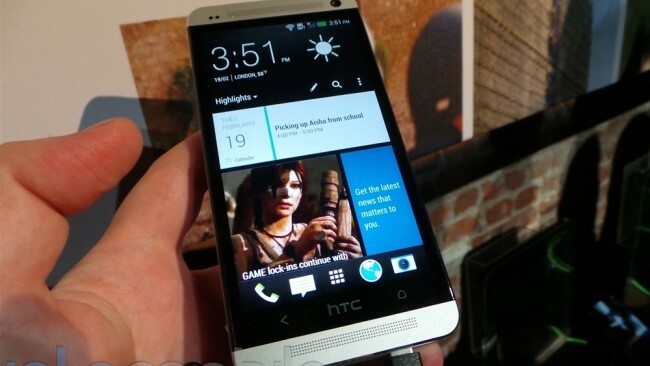 A smaller version of the flagship HTC One, dubbed the One Mini, will debut two months ahead of the supersized phone, which comes out in September. The T6 report, which came just days before the leak, revealed that HTC’s first-ever phablet device will sport a 5.9-inch Super LCD 3 screen. Similar to panels used by competitor Samsung, the One Max’s will display stunning visuals at a native resolution of 1080×1920 pixels. Poised to take on the South Korean electronics company’s upcoming Galaxy Note III, one of its key selling points will also be the stylus functionality. The specifications report apparently says that the Taiwanese mobile firm will incorporate a finer-tipped pen to achieve maximum precision. At the heart of the One Max will sit a top-of-the-line quad-core Qualcomm MSM8974 chipset – also known as the Snapdragon 800. This mobile processor is reported to run at a blazing 2.3GHz, the fastest of its kind. Complementing all that power will be a whopping 2GB RAM. Internal storage on the other hand, according to the report, will vary between a 32GB and a 64GB model. A storage expansion option is also included in the form of a microSDXC card slot for up to 64GB additional spaces. The One Max is also reported to employ HTC’s proprietary Ultrapixel optics for its main rear camera. It will also come with optical image stabilization (OIS) technology, much like the One. The phablet’s front-facing camera, on the other hand will incorporate a 2.1 megapixel sensor and a wide-angle lens. In terms of battery performance, HTC is aiming for the top of the mountain. Already upping the capacity to 3300mAh, the One Max is purportedly designed to support a first party accessory known as a power jacket. This is planned not to just envelop the device as a protective case, but to double as an external power source that jacks up an additional 1250mAh to the battery. That’s 38% extra juice that would extend the handset’s power capacity. Finally, the One Max will apparently not be shipping out with Jelly Bean. The report indicates that the device will run on Android’s next version, 5.0 – better known as Key Lime Pie. Given the release window of the OS later this year, it coincides well with HTC’s phablet schedule, further adding to the credibility of the leaked information. HTC is finally stepping up to Samsung in the phablet market segment. With an offering such as the One Max, it may be on its way to give the South Koreans a heck of a fight for the top spot. Packed with some of the most powerful features of any phone or tablet in its generation, HTC’s first phablet device is one to watch for. Stay tuned for more news about the HTC One Max and the One Mini. Lauryn Hill is one of my all-time fave artists! Been a fan of hers since her appearance in Sister Act 2. Check out my YouTube playlist below for some of here sick beats! Hope you enjoyed my music collection. Watch out next month for the new Top 5 Music Video Faves feature!